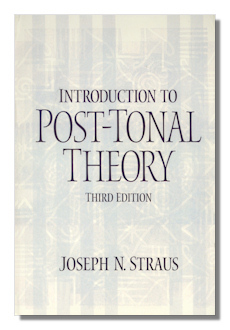 This third edition of Introduction to Post-Tonal Theory by Joseph N Straus of the Graduate Center of the City University of New York (CUNY) is the standard work for music specialists wanting to understand the theory behind non-tonal music of the twentieth and twenty-first century. Although surprisingly short for the subject matter, at under 275 pages, this book is remarkably effective and can safely be recommended as one of the best of only a handful of standard works on the subject. Given the complexity of the theoretical underpinnings of music in the last hundred years, to cover so much so well in so little space means that such a book is either going to be superficial and highly unsatisfactory; or is an expert distillation by someone so familiar with and so confident in exposing and explaining their subject matter to a wide audience that its brevity and focus work admirably. Introduction to Post-Tonal Theory is squarely in the latter category. The book is divided into six carefully-scoped chapters of roughly 30 pages each. These look first at basic definitions and concepts… pitch and pitch class, equivalence, notation, intervals; in greater depth at Pitch-class sets; at other musical relationships… transposition, inversion and contour; at centricity, referential collections, triadic post-tonality and collection theory; at basic twelve-tone operations; and then in greater detail at twelve-tone theory as practiced specifically by composers from Webern and Schoenberg to Boulez and Babbitt. Each chapter has worked analyses from established compositions… from Webern's "Three Songs", Bartók's fourth string quartet, Berg, Schoenberg and Stravinsky. Each chapter also ends with extended, apposite and challenging exercises to which a PDF AnswerKey is available online – in the Instructor resource center at www.pearsonhighed.com. Each chapter also concludes with a welcome annotated bibliography for further study and examples. These are the three chief advantages of Introduction to Post-Tonal Theory, then. It's very comprehensive, covering almost all (significant) developments and strands in post-tonal music. Despite its length, each is dealt with thoroughly and without omitting anything that needs to be known in order to understand the way musicians have composed in the many idioms developed since the Second Viennese School. It's well-written: explanations are universally strikingly clear and understandable. The illustrations from the work of three dozen or so composers from Ives onwards clarify where examples are needed. But perhaps the most striking advantage of this book is Straus' ability to explain so clearly the essence even of complex theoretical ideas and practices such as Inversional Axis in the context of Centricity. Yet its material is to no extent pre-digested or destroyed by over-simplification. Neither is is made inaccurate by drawing the (usually mathematical) teeth from ideas no matter how complex. Rather, Straus takes a paced, methodical, logical approach to each topic. He introduces it in context (the topics of the book have been very well sequenced) and – perhaps most significantly of all – uses language that's so transparent that merely to follow his descriptions, explanations and illustrations carefully is to understand each aspect of the theory under consideration. This is a huge achievement. When dealing with Sets in the chapter 3, for example, Straus reminds the reader of enough basic set arithmetic for the numbers of members of sub- and supersets to be obvious as their musical relationships are explored. Or Segmentation, for example. Straus anticipates precisely the perplexities and questions which someone approaching this area of analysis is going to have. And provides answers step by step and with just the right amount of illustrative material. Similarly, Straus is sufficiently expert in the entire corpus of musical theory to make cross-references (sometimes outside contemporary music) and underline common grounds as needed… the operations (covered in detail earlier) to which a tone row can be subjected, for example. The success of this book can be attributed, too, to the liberal use of diagrams, charts, tables, formulae and the many score extracts. Some of these are a little small and not so easy to view as they might be. But they're still clear enough (indeed the book is very well-produced) to be usable nevertheless. There is a comprehensive and useful index. The book also has two final Appendices– a list of Set Classes, and Index Vectors. On first sight, Introduction to Post-Tonal Theory looks as though it has more in common with a book on algebra or physics. Closely annotated diagrams appear on every page. At first sight that may be intimidating. But you barely have to have worked at a section and remarked the clear, declarative sentences in which Straus excels and which he uses to such amazing effect to realize that, even for a non-specialist, the theory of the book is not only one that's well within your grasp, however dense it is necessarily to embrace the majority of post tonal techniques and historical developments; but it's a theory whose very intricacies – thanks to the judicious use of musical examples and references to composers' origination and adoption of which – you'll welcome. It's an expensive book at over $100. But its complete and lucid coverage of those aspects most central to the development and uniqueness of contemporary music, and the success in understanding them which it almost guarantees because of Straus' lucid style not to mention the extremely practical and exhaustive adherence to examples of real music make the price justified. Indeed, this third edition has updated the earlier already classic text with recent research and developments such as transformational networks, neotonality and interval cycles that anyone seeking to understand how and why recent and contemporary music written in and across a broad range of styles and from a large array of theoretical perspectives will not be disappointed if they work their way carefully through it. Very strongly recommended.